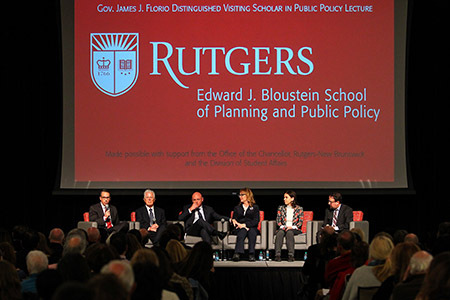 On October 24, 2018, the Bloustein School hosted the annual Governor J. Florio Distinguished Visiting Scholar in Public Policy Lecture, “Making informed choices for the public good: Advancing civil dialogue on gun policy,” with special guests former Congresswoman Gabrielle Giffords, the victim of a shooting in 2011 and her husband, Navy combat veteran and retired NASA astronaut Captain Mark Kelly. 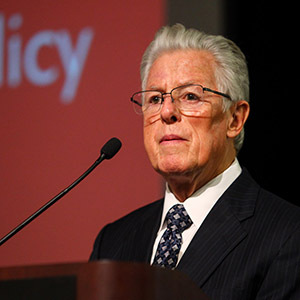 In 1990, Governor James J. Florio signed into law one of the nation’s toughest law on assault weapons, banning the sale and restricting ownership of a wide range of semiautomatic guns. Nearly 30 years later, gun safety and violence have risen to the top of many political agendas as the U.S. deals with what many are calling a “human rights crisis,” as gun violence has become an almost everyday occurrence. 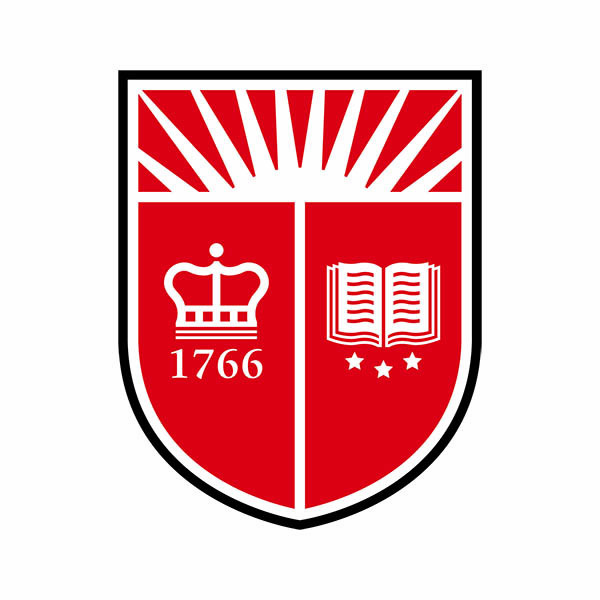 Now a senior policy fellow at the Bloustein School, Gov. 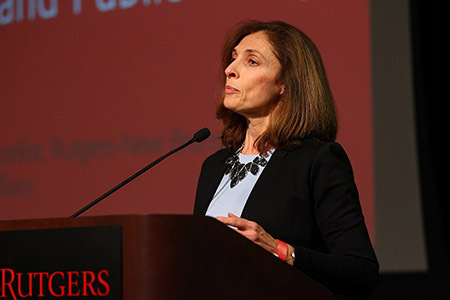 Florio welcomed guests and encouraged members of the audience to continue an open dialogue on the topic of gun policy. “The turnout and enthusiasm shown for tonight’s event really are a tribute to our honored guests who have truly demonstrated leadership in this area,” he said as gave his opening remarks. “They have really shown the way for people who do not understand the problems associated with the epidemic of gun violence. As with any other epidemic, there is a need for education, there is a need for remediation,” he continued. “And that is what we are here to talk about—how to create good public policy solutions to help curb gun violence.” He also discussed some of the political challenges he faced while working on the hotly contested assault weapons ban passed during his tenure. 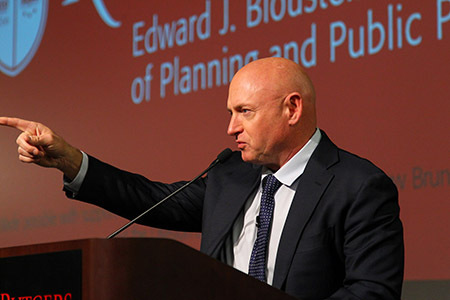 Mark Kelly blended the personal and political as he discussed his wife’s recovery from a traumatic brain injury, emphasizing the importance of endurance and not giving up when fighting toward a specific goal. He explained their advocacy for responsible gun control measures through their group, Americans for Responsible Solutions. 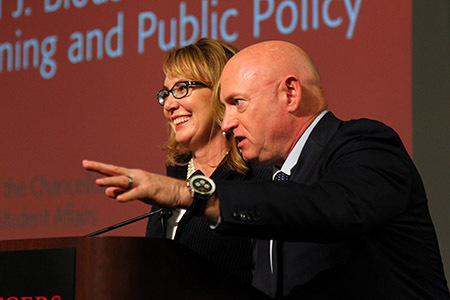 Since her injury, Congresswoman Giffords and Captain Kelly have traveled the country advocating for stiffer laws. The event also served as the forum for New Jersey Governor Phil Murphy announcement of a new grant designating Rutgers University as New Jersey’s Center for Gun Violence Research (CGVR). He noted New Jersey’s record on gun violence prevention serves as a model for other states to emulate. New Jersey has some of the strongest gun laws in the country—including background checks, extreme risk laws, and strong concealed-carry permitting requirements—and those laws are actually working as the state has one of the lowest percentages of gun violence deaths in the nation. New Jersey’s real problem, he said, is gun trafficking, as firearms come in from other states with less restrictive laws. That issue has become a primary concern to many voters and is the reason we need strong federal laws. A 2013 graduate of Barnard College in with a BA in Asian and Middle Eastern Cultures, Cecille worked and lived in Kyoto, Japan for three years. Her experiences as an undergraduate and living abroad helped shape her progressive politics and values and led her back to her home state to pursue her master’s degree. 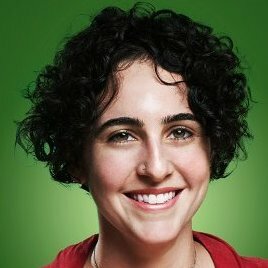 She has over two years of advocacy experience with organizations including Food and Water Watch New Jersey and New Jersey Citizen Action and believes that grassroots organizing is the strongest force behind social change. The panelists included (from left to right) Bill Castner, a Senior Advisor to Governor Phil Murphy, Gov. James Florio, Capt. Mark Kelly, Congresswoman Gabrielle Giffords, Bloustein School MPP/MCRP candidate Cecille de Laurentis, and Stuart Shapiro, Bloustein School Associate Dean and Professor of Policy, who moderated the panel. 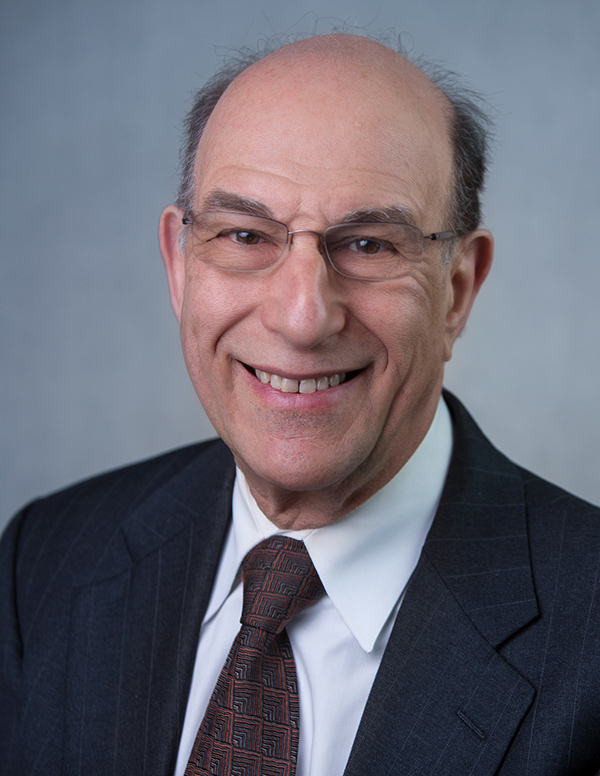 Stuart Shapiro, Bloustein School Associate Dean and Professor of Policy moderated the panel, which included also included Gov. Florio, Congresswoman Giffords, and Capt. Kelly. Bill Castner, a Senior Advisor to Governor Phil Murphy rounded out the discussants. “The work that we do on this campus, and civic engagement efforts around the country, are founded on something more expansive, a more multi-faceted notion of citizenship.” Democracy, she noted, requires that we think and act like citizens not just on Election Day but every day. 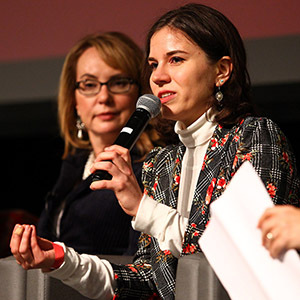 She also encouraged students and young adults around the country to embrace and be equipped to use the tools available to them—whether voting, petitioning, through the media or other means—to influence not only the decisions of their local, state and federal leaders but also their fellow citizens.